The father is a respected rabbi who has counseled thousands. The son is a world-renowned psychologist who has plumbed the secrets of human behavior.Together, Rabbi Raphael Pelcovitz and Dr. David Pelcovitz have created a remarkable book that draws from the wisdom and insights of classic ba alei mussar and applies it to recent research and clinical findings from the burgeoning field of Positive Psychology.Life in the Balance examines the tenets of Positive Psychology, which focuses on actively nurturing people s strengths, and discovers that eternal truths of Torah present many fascinating connections the principles of Positive Psychology. 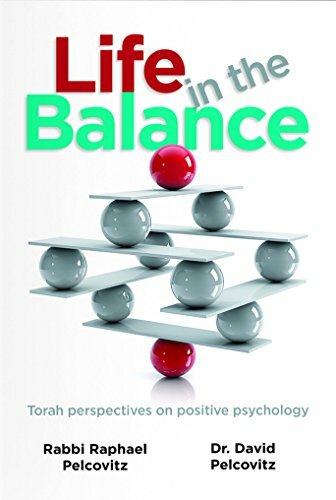 The interaction between classic mussar insights and practical psychological techniques is both enlightening and effective.At once scholarly and practical, academic and innovative, Life in the Balance shows us how to live a full and satisfying Torah life that incorporates core values such as "mentschlichkeit," optimism, and truth. Each chapter focuses on a classic middah (character trait), and includes practical recommendations based both on eternal Torah wisdom and contemporary psychological thought.In a world of superficial scholarship and quick-fix self-help, Life in the Balance offers a profound and yet understandable view of true self-refinement.